As we get closer to a premiere date for Cougar Town season three (likely will be announced at the ABC TCA Winter Press tour on Jan. 10), the producers of Cougar Town have set up a very cool cross-country Cougar Town Viewing Party tour! The festivities began yesterday (Tuesday, Dec. 27) in Sarasota (where the series is set), Louisville, and Atlanta. Josh Hopkins (who plays Grayson) and Ryan Devlin (who plays Smith) were on hand in Louisville at Drake's St. Matthews to thank fans for coming. In Sarasota, executive producer Kevin Biegel was there along with actors Ian Gomez (who plays Andy) and Brian Van Holt (who plays Bobby) at Michael's On East. And in Atlanta, actor Dan Byrd (who plays Travis) and writer Katy Purdy were on hand at Dantanna's. Fans got to watch two (or three in some cases!) episodes from the upcoming third season of the sitcom, drink wine (maybe out of Big Carl, and yes R.I.P. Big Joe), got a Cougar Town US Tour t-shirt and play the very fun Penny can game that they play on the show with some of the stars on hand! How cool is that? Can this show get any cooler? It's "100% Cougar Free" and "Badly Titled," but it is one of the best ensembles on television and you need to watch it when it returns to ABC. The next wave of viewing parties are in San Diego on Thursday, January 5; in Los Angeles on Friday, January 6 (with set visit) and in Chicago on Saturday, January 7. Fans who submitted their ticket request will get a confirmation this week. Much more tour dates to come and three more cities will be announced on January 4 by executive producer Bill Lawrence on Twitter: @VDOOZER. Among the cities that will have viewing parties in January/February are New York City (three different events), Boston, Las Vegas, Austin, San Francisco, Phoenix, Philadelphia, somewhere in Connecticut, and two more in Los Angeles. So go follow him and make sure you attend one of these viewing parties in your area because a cast member and writer/producer will definitely be on hand! Start practicing your penny can shot! TBS will say goodbye to 2011 with a big bang! They will say goodbye to 2011 and hello to 2012 with The Big Bang Theory New Year's Eve Marathon. 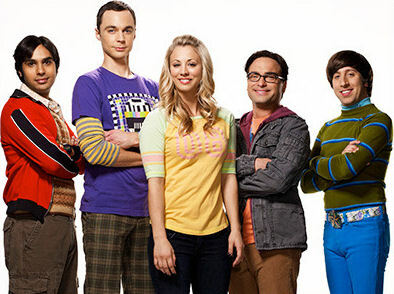 Watch The Big Bang Theory starting at 7pm ET with ten smart episodes running through 12 midnight as we start 2012. Among the storylines are Raj inviting Penny to go the People Magazine party, but the only way he can talk to Penny is while being drunk, which puts a halt to their friendship. The season two finale, where Sheldon meets with the University's Dean, who requests that he leads an arctic expedition to the North Pole, so Sheldon asks the guys if they would like to come along. And the marathon closes out with a season four episode where Penny's father shows up and she asks Leonard for help by pretending to still be her boyfriend. Marathon episode list: "The Griffin Equivalency," "The Monopolar Expedition," "The Financial Permeability," "The Cornhusker Vortex," "The Cooper-Nowitzki Theorem," "The Vengeance Formulation," "The Gothowitz Deviation," "The Justice League Recombination," "The Bat Jar Conjecture" and "The Boyfriend Complexity." Stay with us on Friday for our annual look at marathons on New Year's Eve and Day. We have given you some already but we will remind you of those, too. Come on back for that and stay tuned tomorrow for our annual look at this year's passings of sitcom stars. They may be gone, but they are not forgotten.